Below you fill find all funeral homes and cemeteries in or near Springfield. Popular neighborhoods in Springfield include: Knox Knolls. Suburbs of Springfield: Office Educ, Ill R O Tax Div, Ill Secy State, Jerome, Leland Grove, Memorial Med Ctr, Riddle Hill, Secy of State Vehicle Svcs, Southern View, St Johns Hospital, State of Illinois, State Rev 3386, State Rev 3667, State Rev 3707, State Rev Box 3547. 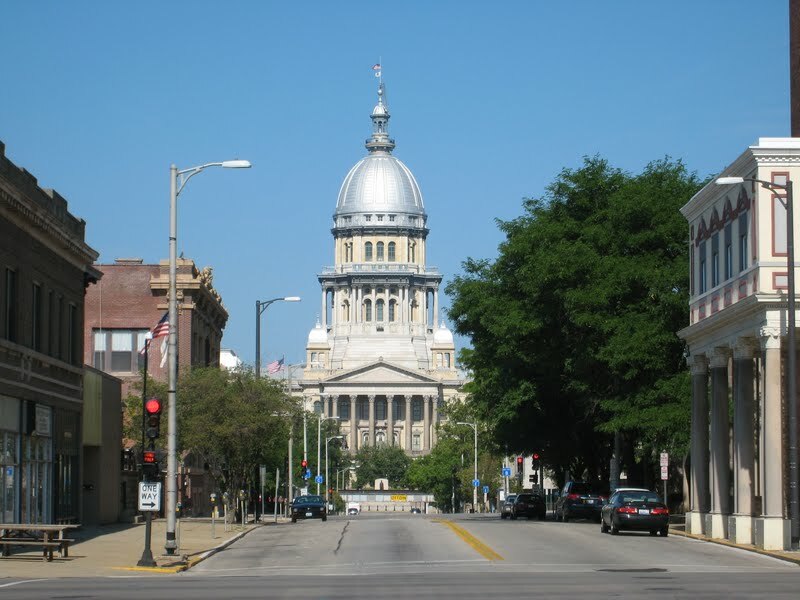 Springfield is also known as: East Springfield, East Springfield, Illinois, and Sangamon County / Springfield city. Zip codes in the city: 62701, 62702, 62703, 62704, 62705, 62706, 62707, 62708, 62711, 62712, 62715, 62716, 62719, 62721, 62722, 62723, 62726, 62736, 62739, 62746, 62756, 62757, 62761, 62762, 62763, 62764, 62765, 62766, 62767, 62769, 62776, 62777, 62781, 62786, 62791, 62794, 62796. Sangamon County funeral flowers can be purchased from one of the local funeral shops we partner with. There are currently 23 funeral options for this city. Some of the notable people born here have been: Ifeanyi Ohalete (american football player), Andre Iguodala (basketball player), Donnie Beechler (race car driver), Dave Winters (farmer), Ben Cannon (teacher), Kevin Seitzer (baseball player and coach), and Jeff Fassero (baseball player). Springfield is the capital of the U.S. state of Illinois and the county seat of Sangamon County with a population of 116,250, as of the 2010 U.S. Census, making it the sixth most populated city in the state. It is the largest city in central Illinois. As of 2013, the city's population was estimated to have increased to 117,006, with just over 211,700 residents living in the Springfield Metropolitan Statistical Area, which includes Sangamon County and the adjacent Menard County. Present-day Springfield was first settled by European Americans in the late 1810s, around the time Illinois became a state. The most famous past resident is Abraham Lincoln, who lived in Springfield from 1837 until 1861, when he went to the White House as President. Major tourist attractions include a multitude of historic sites connected with Abraham Lincoln including his presidential museum, his home in Springfield, and the historical town of New Salem, with a short drive from the city.The city lies on a mostly flat plain that encompasses much of the surrounding countryside. Hilly terrain lies near the Sangamon River. Lake Springfield, a large artificial lake owned by the City Water, Light & Power company (CWLP), supplies the city with recreation and drinking water. Weather is fairly typical for middle latitude locations, with hot summers and cold winters. Spring and summer weather is like that of most midwestern cities; severe thunderstorms are common. Tornadoes hit the Springfield area in 1957 and 2006.The city is governed by a mayor–council form of government. The city proper is also the "Capital Township" governmental entity. In addition, the government of the state of Illinois is also based in Springfield. State government entities located in the city include the Illinois General Assembly, the Illinois Supreme Court and the Office of the Governor of Illinois. There are three public and three private high schools in Springfield. Public schools in Springfield are operated by District No. 186. The economy of Springfield is marked by government jobs, and the medical field, which both account for a large percentage of the city's workforce. It was written by Lincoln Courier on March 27th, 2019 that David L Doom perished in Springfield, Illinois. Doom was 74 years old. Send flowers to express your sorrow and honor David L's life. It was noted by Ashland Daily Tidings on March 26th, 2019 that William Karl "Bill" Sipfle passed away in Ashland, Oregon. Sipfle was 77 years old and was born in Springfield, IL. Send flowers to share your condolences and honor William Karl "Bill"'s life. It was noted by Orange County Register on March 22nd, 2019 that Richard G Price passed on in California. Price was 82 years old and was born in Springfield, IL. Send flowers to express your sympathy and honor Richard G's life. It was written on March 20th, 2019 that Dorothy G Huddleston (Minnick) perished in Springfield, Illinois. Ms. Huddleston was 88 years old and was born in Abingdon, VA. Send flowers to express your sorrow and honor Dorothy G's life. It was noted by Lincoln Courier on March 19th, 2019 that Eugene A Beccue perished in Springfield, Illinois. Beccue was 77 years old. Send flowers to express your sympathy and honor Eugene A's life. It was revealed by Lincoln Courier on March 19th, 2019 that Walter David "Dave" Dinger perished in Springfield, Illinois. Dinger was 75 years old. Send flowers to express your sympathy and honor Walter David "Dave"'s life. It was written by Lincoln Courier on March 18th, 2019 that Charles Arthur Branson passed on in Springfield, Illinois. Branson was 74 years old. Send flowers to express your sorrow and honor Charles Arthur's life. It was reported by Lincoln Courier on March 13th, 2019 that Vickie Hum passed away in Springfield, Illinois. Hum was 60 years old. Send flowers to share your condolences and honor Vickie's life. It was written by Lincoln Courier on March 10th, 2019 that Claude Elden Brinner perished in Springfield, Illinois. Brinner was 90 years old. Send flowers to share your condolences and honor Claude Elden's life. It was disclosed by Lincoln Courier on March 8th, 2019 that Thomas R "Tom" Moos passed away in Springfield, Illinois. Moos was 79 years old. Send flowers to share your condolences and honor Thomas R "Tom"'s life. Planning a funeral can be a stressful experience. iMortuary strives to make locating funeral providers in Springfield easier. Browse our site to locate Springfield area funeral services such as cemeteries, funeral homes, cremation providers, and funeral flower arrangers. The first European settlers to the area of Springfield were trappers and traders, who arrived in 1818. They initially named the settlement Calhoun, but later changed the name when the senator, John C Calhoun, who the town was named after was seen in a less than positive light. They choose the name Springfield, as the Springfield in Massachusetts is what they strived to emulate. The official website for the city of Springfield is http://www.springfield.il.us. Longtime Illinois horseman John Cisna of Springfield has been killed in a truck ... Cisna is survived by his wife and two children, Stephanie and Brian. Funeral arrangements are pending. Chris Dettro can be reached at 788-1510. Listing all funeral homes in Springfield, Illinois so you can easily send flowers to any location (same day delivery) or find any funeral service. Funerals in Springfield, IL on Yahoo! Local Get Ratings & Reviews on Funerals with Photos, Maps, Driving Directions and more. We work with local florists and flower shops to offer same day delivery. You will find budget sympathy flowers in Springfield here. Our funeral flowers are cheap in price but not in value.